Thanks again…..our guests are still talking about you now! So, I recommended the fantastic Mickey Toones Caricature Artist – highly recommended, very friendly and skilled caricature artist who I’ve had the pleasure of working with on several occasions since first meeting in 2010, when we were both hired to perform at a military ball (I still have the caricature portrait he drew of me then framed on my wall to this day!). On the wedding day, Mickey was set up in place ready to go as I arrived and they were still giving their wedding speeches. So whilst we waited, I had the offer for an up to date caricature from Mickey – well… there was nothing else for me to do until after the wedding speeches were done, so it would have been rude not to! I’m friends with Mickey Toones on Facebook so gets to see all my breakdancing, travel, climbing and training videos and decided to add some incredibly accurate muscles to this portrait, life-like! Hehe, love it! Once the speeches were over, it was our time to shine! Mickey had a little station set up where people could come to him to have their caricature draw and I mingled the outside terrace area for a couple of hours getting all their guests, including the toughest sceptics involved and amazed with my wedding magic. 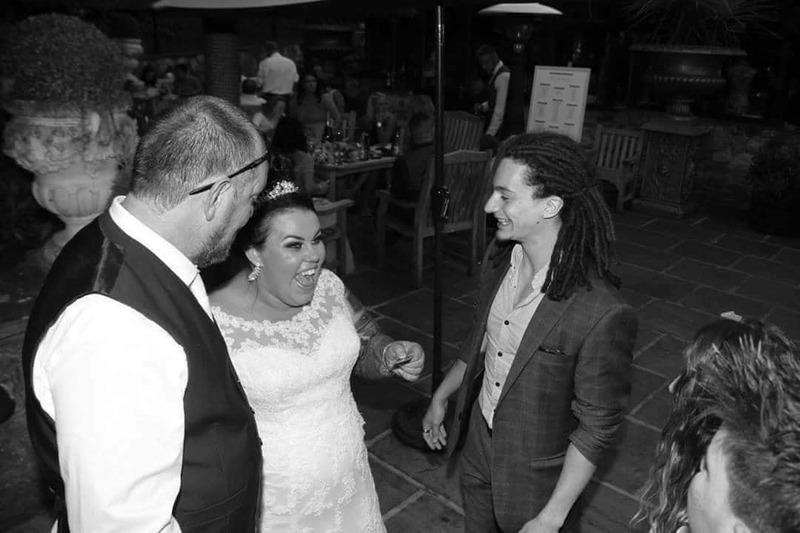 During the performance time, I had Michael and Hollie involved with a few little personalised bits of magic too – something a bit special for them to add to all the other awesome memories of their big day! All in all, every single one of us had a blast – receiving thanks from the lovely couple afterwards for our entertainment and I think me and Mickey had a great afternoon too, I know I certainly did anyway! 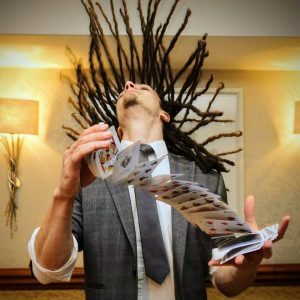 Whether you’re based in North Yorkshire, or further afield, if you’re looking to add something a bit different to your big day, hiring a wedding magician is such an easy addition – requiring minimal effort on your behalf but adding a HUGE IMPACT for you and your guests! Please enquire with your wedding date and other details and I’ll get back in touch with my availability and quotes for the best options to suit your wedding day entertainment!